I have come to the conclusion that I'm addicted to caramel coloring. I drink too many sodas (pops, cokes, soft drinks, whatever you call them in the part of the country - or world - where you are). I think I'm addicted. But to what? Well, the first thought, of course, would be caffeine, but it doesn't matter if it's a caffeinated or a caffeine-free drink. Second guess might be the sugar, but I've transitioned to primarily diet drinks (I will occasionally drink a non-diet drink; my poison of choice these days is usually Splenda - sucralose - and Publix diet colas - I'm drinking one of the caffeine-free variety intermittently as I write this, and they just put them into twelve-pack form, and you can get 3 twelve packs for $7, so it's a pretty good deal; of course, Coke Zero is probably my current absolute favorite soda, but it's aspartame-sweetened, and RC Cola for non-diet drinks). Carbonation, you might guess? Possibly, but it's dark colas that I like; I will drink the occasional Sprite or Ginger Ale or Mountain Dew (which is my favorite cold remedy), but it's the dark sodas that I seem to have me addicted. I generally prefer Coke products (and now Publix products), but Pepsi will do, and I'm a fan of Dr. Pepper products as well. Even the grape sodas and root beers are good. So, what is it about the dark sodas? What do they all have in common that the others don't? Caramel coloring! That must be the thing to which I'm addicted, the caramel coloring that infuses each and every dark-colored soda on the market. 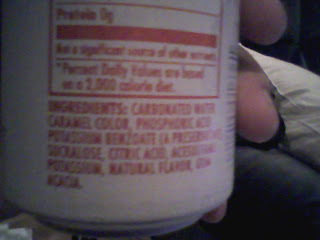 In fact, looking at the ingredients, caramel color shows up second on the list (i.e., it's the second highest percentage ingredient in the beverage). You can see it in the picture over to the right (if you can't make it out, click to enlarge the picture; if you still can't, take my word for it). Only carbonated water is in more abundance in the drink (and we've already established that it's not carbonated water that causes my addiction, since if it were, light- and clear-colored sodas would satisfy; wait, is "clear-colored" an oxymoron?). Anyway, based on my analysis of the ingredients and what it takes to satisfy, I have come to the conclusion (presented in the first sentence of this post): I'm addicted to caramel coloring. That's the one ingredient that dark-colored sodas have in common (among all varieties, including diet and caffeine-free colas) that is not in common with clear- and light-colored sodas. Apparently the aliens that have visited my neighborhood three times like the Diet Mt. Dew, too! See the video here. Totally agree with the caramel color addiction. If I drink a no name cola I still crave a Pepsi or Coke. If I drink coffee, the caffeine doesn't help, I still want cola. The only consistency in my analysis is the caramel color. It is an addictive substance!